I left Skradin early so I could get to the Krka Park for when it opened. I’d heard it gets very busy during the day so wanted to avoid the crowds. I decided to take the option to enter the park by boat as the lady where I was staying said it was much more beautiful than the pedestrian entrance. I’d lucked out. I was on the first boat out and the views entering the canyon were stunning. The boat goes really slowly so you can take in all the rich vegetation and relax! Arriving in the park I started the hike to catch all the views of the endless large and small waterfalls. I completed it in under an hour and treated myself to a swim in the large waterfall at the end, the only one you can swim in. It was just magical to hear the force of the water and splash around in such a natural sight. A wonderful therapeutic break in the middle of hammering asphalt roads in the crazy heat! I left the Krka Park after lunch and headed for Split. My route seemed very cross country taking me through the outskirts of the Krka Park with very few people in sight. It was a mega hot day and very little shelter wherever I went. The few shops I did pass I made sure I stopped to buy as much water as I could carry! I was approaching the outskirts of Split and a car stopped ahead of me and put its hazards on. There were very few cars on the road and as I passed I was expecting him to say something. As I did he said nothing, nor made any gestures. So I cycled on none the wiser. Up ahead the road was getting wider and the cars driving faster. After also seeing a 100km sign I realised quickly I was on a motorway. Oh dear god. Up ahead was a turning so I took it even though I had no idea where it was taking me. Lucky for me it took me through the Split suburbs of Klis and Solin. Whilst riding I could see the road I was on was up a lot higher and entering an enormous tunnel, a terrifying thought that if I’d carried on the motorway I would have had to just stay on it and hope for the best! Arriving in Split just before sunset I was pooped after a morning of sightseeing followed by a 140km bike ride in 40 degree heat. Despite feeling very tired I was up at the crack of dawn as had booked a day trip by boat to visit the Blue Cave and Hvar. First stop was the Blue Cave after a 2 hour speed boat ride. It was fun to have a day off the bike to see some sights! The boat dropped us off and then we had to wait for about half an hour before we could board a smaller boat to go into the cave. The cave itself was discovered in the 1800s and quickly become a tourist destination due to its beautiful neon hues inside. As we entered the cave ducking our heads to avoid hitting them it was so bright and unusual. The bright neon like blue colour that the cave omits is simply because of the sun reflecting against the water. We then made our way to the island of Hvar. The island is very cute and due to it being quite far away from mainland Croatia, feels a lot slower paced than the coastal towns I’d been visiting. I simply spent a few hours walking around the island, taking in the views from the Castle and treating myself to bubbles and snacks! I’d had a wonderful day off the bike recharging and taking in the wonderful sights. I left Split the next day and headed for the town of Imotski close to the Bosnia and Herzegovina border. The riding around Imotski was beautiful, skirting the town of Omis with endless mountains and forests around me. Imotski was also Home to one of the most beautiful ‘national’ football stadiums I had ever seen! The border crossing was quick and easy and I also got some stamps in my passport (geek)! As soon as I entered Bosnia and Herzegovina it felt completely different. The roads were pretty bad and for about 4 hours or so, all I saw was vehicle scrap yards and desolate towns. It didn’t help that it was grey and thunderstorms were scheduled, so it made the landscape look more unwelcoming. I’d heard the scenery was stunning and that Mostar was a must to visit, hence why I decided to go off course from Croatia and into Bosnia and Herzegovina before entering Montenegro. It was beautiful, don’t get me wrong, but after being spoilt with fantastic roads, endless tourism set up and insanely good scenery in Croatia, Bosnia and Herzegovina had a lot to live up to! I entered Mostar from up high and took in some beautiful sights down into the valley. I arrived early and had the afternoon to walk around and sightsee. The old town which is quite small was packed out, making it hard to even walk through. I was determined to get to the famous bridge and see if anyone was jumping off it. There was a diver who seemed to be preparing and everyone had their phones out filming! I waited about 10 minutes before it all seemed to just be hype and went to go find food and drink. I sat in the old town and scoffed a lamb kebab with gorgeous rice and veggies, followed by wine, Bosnian coffee and baklava all for about 10 euros. That might even be pricey for this area but I didn’t have a care in the world as I was stocking up on nutrition watching the word go by in the old town. The next day I headed for the town of Tribenje which would be my final stop in Bosnia and Herzegovina before entering Montenegro. The scenery was pretty and in parts the roads a little better than the day before. I took a break by the side of the road and puppies ran out of the bushes, quickly followed by Mum. Despite being strays they were so friendly and were happy to have cuddles. I searched my bag for food and gave them some nuts which they didn’t like. I then went for the sesame snaps and broke small pieces off. They lapped it up and ate the whole lot. I checked for water and they had some out already so figured other people had been taking care of them too. I said farewell and ventured on! My GPS took me down a side road which was just massive loose rocks and quickly became big sections of thick mud and water. I tried to get through and really struggled. I decided to turnaround and find another road hoping for asphalt. I stupidly hadn’t prepared for countries outside of the EU. My phone wasn’t working, so I couldn’t look at maps online and I had no hard copy map either. I had no idea where I was or the road network, nor could I even understand half the signs, they looked to be a combination of Greek and Russian! All I knew was that the road the GPS took me down was 10 miles until the next turning I needed to take and I was about 14 miles from Tribenje so it must be the most direct route. I decided to go for it hoping that the loose rocks would only last for a short stretch and asphalt might appear, as this is was most of the minor roads seemed to do. It was about 2pm by this point and I figured worst case scenario was that if I had to walk the whole road I could still reach the town by night fall. I set off with fingers and toes crossed. 2 hours later and I was still walking on loose rocks and through sections of thick mud 😦 it was so so tough and I was burning a lot more calories than if I had been riding. I kept on checking to see if I had signal on my phone to look at a map and nothing. I just plodded on and hoped I wouldn’t have to camp out in the open with no food or water. I was rationing my water until I passed a trough with rainwater. I filled up all my empty bottles and chucked in some purification tablets ignoring the dead wasps in the water. Minutes felt like hours and there wasn’t any asphalt in sight. I can’t tell you how hard this afternoon was for me. The rocks were so big you could hardly walk, I was wearing cleats and pushing about 20-30kg of weight through the rocks, with the ‘path’ going up and down. You’d thing down would give me a break, but it was worse as I had to hold my breaks to stop my bike from falling. I’d given up hope of making it to the town and about 20 minutes later I saw asphalt going down into a valley, it was Tribenje up ahead and I had about half an hour left before dark. I was so happy after walking for about 5 hours. Despite now being on a proper road I couldn’t cycle much as my breaks had started to wear down. The descent was so steep and I was so scared of falling off the side of the valley. I was low on energy and just wanted to be done with the day but was also ecstatic to know I’d have a bed and some food for the night. The next day I was thankful to be leaving Bosnia and Herzegovina. I was happy to have visited Mostar but not so happy with the riding and conditions of the roads. If there is a next time I must prepare more and take back up maps! The border crossing from Tribenje into Montenegro was high up with picturesque views down to the sea. My first stop was Herceg Novi on the coast. It was a quaint town with a gorgeous little church in the old town where I had a late lunch. A lovely first stop in Montenegro which was always on my hit list for this bike trip. 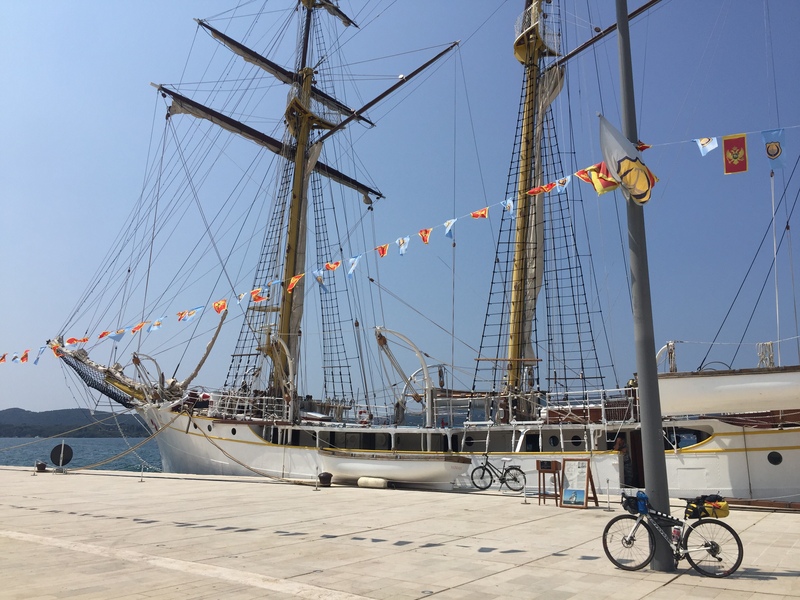 I was still processing that I’d cycled to Montenegro from Holland. Thinking about it was overwhelming, so I decided to just continue to take it day by day. The next day I headed for Tivat and specifically the port where I was meeting Sandy and Penny on their boat. Sandy is my best mates Dad who has been living on a sail boat for the past two years since retiring! It was fab to have some English speaking company and to also get to spend the night on the boat (and see my bike on a boat too)! We met Jeremy who was working on the boat next to us and was at a loose end, so Sandy and Penny invited him for dinner. The night was spent talking about sailing and biking adventures, with wonderful food and wine. It was a stifling hot evening and with the booze and food in me I was feeling a little queasy. Within minutes of dinner ending I threw it all back up in their tiny toilet sink, blocking the whole thing! I was so embarrassed and did my best to try and clean it up. Sandy and Penny were wonderful and looked after me! I felt better after being sick but was gutted to loose all the nutrients from the fab food! I guess it was too much food and drink after surviving on basic and very little food prior. The next morning I felt better and after a fab breakfast (toast which I had missed!) I set off for the town of Budva. The ride to Budva was on a road that was fairly flat but very busy with holiday traffic. That paired with the relentless heat made it a tough ride. I still felt weak after my bought of sickness so took it easy, regularly stopping for water. I passed Vincent just before Budva and we had a long chat about our bike packing adventures! Vincent was en route to Athens and had a lot more gear than me. He was eyeing up my gear and said how jealous he was I was biking so light! I arrived in Budva mid afternoon and just chilled out, wandering around the old town and having leisurely food and drink. Despite the madness of Bosnia and Herzegovina and my sickness on the boat, I’d had a memorable weeks bike packing full of countless adventures!